...I don't know why though. 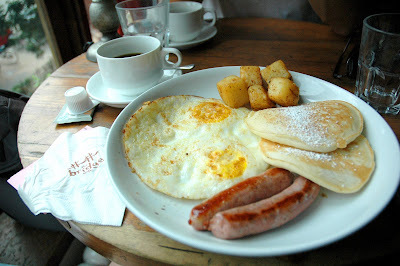 We arrived in Shanghai at around midmorning and we had a plan. The goal was to take our belonging to the hotel and then go straight to the tailors. Where I would be fitted for a suit and Katy could be fitted for a coat. We got everything to the hotel with no problem and then discovered that the tailor was literally about 100 yards away. That was convenient! As soon as we walked into the building, which houses about a million little tailor shops we were inundated with salesmen, who are very persuasive and good at what they do. we knew exactly where we wanted to go since Katy's family had been there last year. We chose our styles and fabrics and then the haggling began. After some debate, I feel fairly confident that we got a good deal. 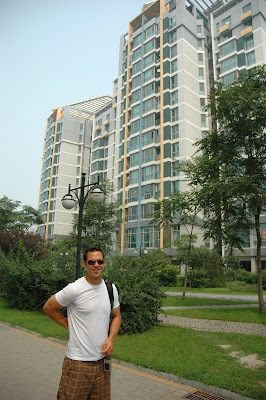 We ended up getting my suit, katy's cashmere coat and a dress (for Katy) all handmade and tailored to our specific muscular physics for a little under $200 U.S.
Beijing is an older and more traditional city and Shanghai seem much more modern and new. There's just a very comfortable feel in Shanghai. We both felt like it was very western in a lot of ways. Here's Katy taking some pictures at large outdoor walking mall that we got to walk around in the midst of our bike tour. This area of Shanghai is called The Bund. On the other side of a large river we could see the downtown Shanghai skyline. It was very beautiful and like most places in China also very crowded. Once again we had our picture taken several times by Chinese people and other tourists. I can't really blame them though, I do have a pretty hot wife. As you can see the view was pretty incredible. The only obstruction was the thick layer of smog that seemed almost tangible at times. Shanghai nights are nearly as bright as the days. Everywhere you look there are colorful neon lights. Even the overpasses have been transformed into urban art. I liked it a lot, but I still couldn't help but think this is what a bug must see as it flies closer and closer to one of those electricfied bug zapping racket thingys. We knew we wanted to go to China sometime while we're living in Korea, but the next few pictures are why we chose to go when we did. 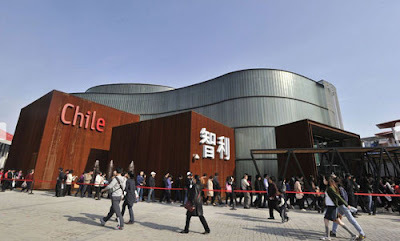 This year, Shanghai is hosting the World Expo., which was AWESOME! There are over 190 different countries represented at the expo and each one has an interesting way of displaying their national culture. The Chile pavilion was our absolute favorite. It had a very modern, industrial, urban look to it. We walked at the expo for hours, so we were so excited to sit and chill out while we listened to a jazz combo in the Chilean pavilion. The Netherlands Pavilion was probably the most bizarre one. It was built to look like a roller coaster, but there was a lot to see and it was pretty interesting. We were pretty excited to go to the Mexico Pavilion, hoping to get a taste of some delicious Mexican food, but the food there was expensive! Mexican food is supposed to be cheap that's part of the appeal. The outside of this pavilion was supposed to look like a giant kite forest. ...so naturally we were pretty pumped to go to the U.S.A. Pavilion. Here's Katy expressing her excitment for the world to see and she did make quit the spectacle. She had no problem letting every tourist know that this pavilion was the place to go! Living in the land of Kimchi, we don't get many chances to enjoy real American food, so when we saw the the America Pavilion had a restaurant called the "American Diner," we could not have been happier. I am very sorry to say though that we were quit disapointed. My corn dog was not very good and the fries were quit soggy, but we did get to eat in a "diner"...kind of. There were a few places that had incredible food and drink though, like the Cuba Pavilion, which had the best mojitos I have ever tasted. Most countries Pavilions had a walking tour of life in the country. Cuba's pavilion was only a bar. I don't know what that says about Cuba, but it was a nice place to take a break and relax. Peru also had some pretty delicious food. In order to get into the pavilions we had to wait in line for sometimes up to about 45 minutes (not bad), but we quickly learned that if you want to hold your place in line in China, you've got to be aggressive. If we left a couple of inches between us or on either side people would shove their way past us. We just learned to look tough and be battle ready at all times. Visitors were encouraged by signs like these to be curteous and NO NOISING!!! Denmark had a pretty cool concept for their pavilion. I guess a huge percentage of the population ride bikes on a regular basis, so we could walk through their pavilion or ride a bike. We chose to the walking path (shorter line), but the bikes looked pretty cool too. In the middle of the Denmark Pavilion was a small pool, where they had their mermaid statue and a national girls choir was singing. A lot of people gathered to watch the performance. Korea is a very modest society. When they go to the beach they all wear long pants and long sleeve shirts. They almost always dress nicely for any occassion and you would never see this. China, was very very different. Most of the babies were completly naked, or if they did wear pants they would be more like chaps. No crotch, no back. Cab drivers would sometimes drive shirtless, bicyclists were often shirtless. We even saw a couple of 4 or 5 year old kid pooping in the middle of the sidewalk. Tip: If you ever go to China, don't go splashing through puddles...probably not rain water. This was probably our favorite area of the city. 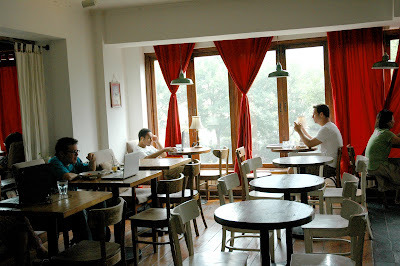 It was in the French Concession district. There were some very small alley ways that have been turned into little boutique shops and restaurants. There's also a very large western population in this area so many people spoke English very well. I think we liked it because it felt a little bit like home. 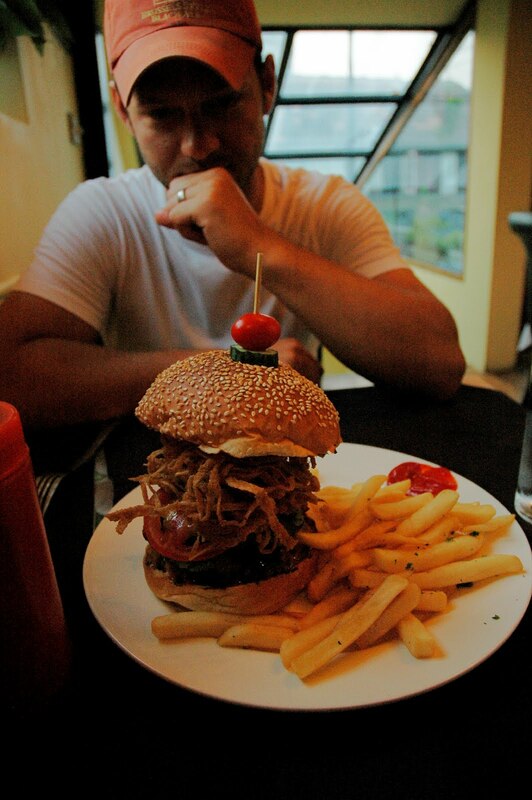 This steakhouse served some of the best hamburgers we have ever had, anywhere. 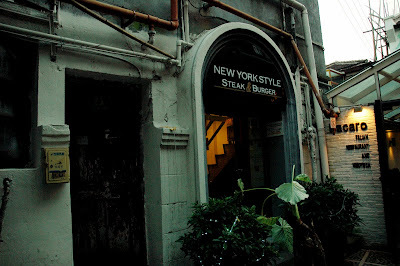 Next time you wake up and find yourself in Shanghai, go to jianguo road and find this restaurant. You will not be disappointed. Look at that!!! Finally, no Korean size portions. Shanghai really is a very beautiful city and I think we both left feeling like we wished we had spent more time there. Our trip to China was jammed full of lots of awesome adventures so we had to break up the posts into 2 parts, Beijing and Shanghai. 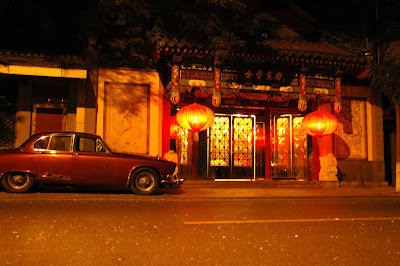 Beijing was the first part of our trip and boy was it awesome. Thanks to some friends of friends, we were allowed to stay in a couples apartment while they were visiting their family, so the above picture was Danny in front of the apartment building. It was a huge place that could have fit our whole Korean apartment in the living room, so needless to say, we took advantage of the REAL couch and flat screen TV. As soon as we got to Beijing on Saturday morning, we dropped our stuff off at the apartment and headed out for our first experience: a Beijing bike tour. 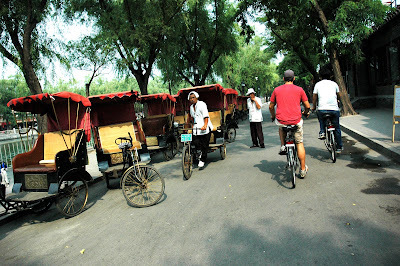 We got on cruisers and headed out on the Beijing (very busy) streets to see the city. Danny and I did a bike tour in both cities and we both agree it was our absolute favorite thing we did. It was just such a great way to see so much of the city in one afternoon. 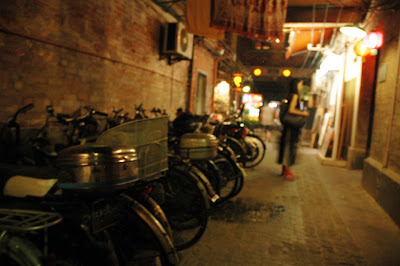 We rode through the tiny alleys and streets of Beijing (the Hutongs) and really felt like we got to see the "real" side of Beijing. 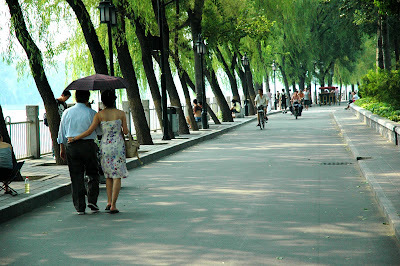 We got to see some really interesting places, some great shopping areas with unique Chinese boutiques, but one of my favorite areas was Houhai Lake. As my Chinese brother put it, it is kinda like Wash Park in Denver but in China! There are shops and restaurants all around the lake (with some delicious happy hour mojitos I might add) and it is a great place to people watch and see the local Beijing scene. We saw many couples on romantic dates, we saw about 15 brides doing a photo shoot, and we even found that the Chinese have no problems with wearing speedos to take a dip on a hot summer afternoon. And when I say hot, I mean HOT... July and August are usually the hottest times of the year and with what felt like 100% humidity, I was about to jump in the lake myself. Our bike tour continued around the lake, through more hutongs, and then toward the end, we even rode around the Forbidden City. The great thing about the bike tour was that we had our own personal tour guide to tell us all about the city so we discovered that there are 9,999 rooms in the Forbidden City and they were all for one man, the emperor. He was the only one who was technically able to live in the city even though it it the biggest palace in the world. Riding around the outside seemed to take forever, so I can only imagine that the emperor must have been a Hide-and-Go-Seek enthusiasts with all of his eunuchs or else he would have been pretty lonely in such a huge place! As we were taking everything in, we noticed a few differences between China and Korea. One big difference was how casual the Chinese seemed compared to Koreans. Koreans seem to dress rather nicely most of the time, but it was a common site to see shirtless men or really casually dressed people all over China. After coming from a basically "shirts at all times, even at the beach" country, we were kinda amazed at the difference between them. Of course when you go to China, you have to go shopping so Danny and I decided to try out our bartering skills at the famous Silk Street Market. We weren't quite sure what we were looking for, but pretty soon, shoes and bags all over the 1700 vendor shops seemed to be speaking to us. We got some great deals, but we could tell that our skills got better and better with every attempt. Danny considered it a complete success when the sales girl would throw the money back at us in frustration after we were victorious in getting a good price. We came away finding that the "good cop/bad cop" routine worked the best and of course Danny enjoyed being the stingy husband while I got to be the frivilous wife. (Not at all like reality, just so you know : ) In the picture above, Danny is proudly wearing our new backpack full of fake Calvin Klein underwear, Chinese paintings, Croc shoes, and many more delights. Beijing is a very historical and cultural city so of course we had to go to Tianamen Square and stare at the huge portrait of Mao Zedong. Unfortunately the museum, Mao's mausoleum, and basically anything else we could do there was closed so our stay didn't last long. It is interesting to see how they idolize Mao still to this day and Danny and I still came away wondering if they like him or not...I guess its time for some Chinese history books. 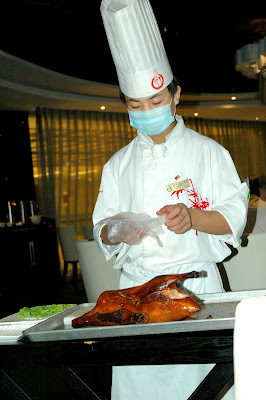 One night we made sure to get Peking duck, which is of course the most famous dish in Beijing and we went to a fantastic place. Many travel books said Da Dong's Roast duck was the best in the city and we definitely weren't disappointed. A very distinguished chef came to our table to cut up our duck which was gleaming in the light, and I finally learned why duck is so famous. We ate the duck in sesame rolls, wontons skins, and dipped the duck skin in sugar which sounds weird but is actually fantastic. It was really delicious and Da Dong's won't disappoint you. Even if you are wearing shorts and a Tshirt, like we were, you will feel like you are getting a 5 star experience. After Da Dong's we went to maybe the most interesting or most disturbing experience of our trip: Wangfujing Street. This street is notorious for crazy food and we definitely got an eyefull of skewered animals and bugs. Wherever you looked, there were sea horses on sticks, scorpions, lizards, and even centipedes that you could get deep fried and salted. This street is only for the brave and not weak stomached, so Danny and decided that we had to at least try something. After being tempted with snake, lamb heart, and yes even the tiny sad little birds below, we decided that a bug would be our best option. (And when I said tempted, I really meant we both made gross faces down the whole street and tried to choose something that wouldn't scar us mentally for life...you know, that kind of tempted) Scroll to the bottom if you want to see what we finally decided on. The last, but definitely not least, event that I will highlight in this obviously ridiculously long post, is our time at the Great Wall. A site not to be missed while in Beijing, Danny and I decided to rent a car for the day with the help of a new friend, and we headed to Mutianyu: one section of the wall. Maybe because it was insanely hot, or maybe because God was smiling on us that day, but we were really lucky to come on a day that hardly any people were at the Wall. We took a ski lift up to the wall and got to hike on it for hours... and I mean hike. People always image the wall as a mostly flat wall that you can take a leisure stroll on, but that is not the case. Mutianyu is especially mountainous so we were climbing quite a bit while we were there. I don't know if it was smog or the humidity, but unfortunately the sky wasn't very clear that day but that didn't ruin our experience. It was just amazing to see such a historic and old place and I am very glad we did it. After we finished our trek on the Wall, the great thing about being at Mutianyu is that you get to ride an alpine slide down the mountain to get back to civilization. Most people I've talked to have said the wall was crazy crowded when they went, so I think we were pretty lucky to have it all to ourselves! Lastly, after the wall, we headed to the Summer Palace which we were told is similar to the Forbidden city, just more beautiful. I was just amazed that a man with 9,999 rooms needed a summer home to vacation in! Hope you enjoy the videos of me eating fried scorpion. Danny and I both had 2 scorpions each, and basically they just tasted crunchy and salty...not bad at all ; ) The thing that just freaked me out was when I thought my scorpion was still alive, as you will see in the video, as the tail hit my face when I was trying to eat it. I survived though and neither of us got sick after that so I would say that "bug eating experience" was a success! 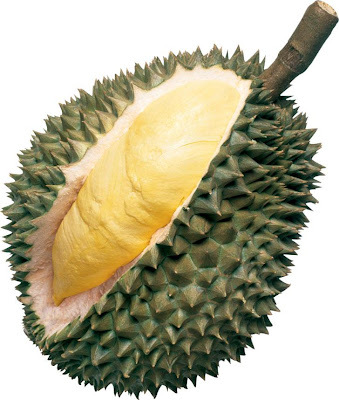 Durian is what I like to call "the devil's fruit". It is a spike covered fruit found mostly in Asia and somehow people thought, "Hey, this fruit is covered in sharp points so whatever is inside must be good!" WRONG!! If you imagine garbage and vomit mixed into a "custard-like" consistensy, you will have durian. It is so smelly that it is even illegal in some public places! (In Singapore you aren't allowed to bring it into public buildings or the subway.) Yet, even after that, somehow there are people who like this disgusting sorry excuse for something edible. Danny and I found it made into pastries at a buffet we went to in Beijing . We decided to try it because we were feeling adventurous so this video is what you get to see from the experience. If you have the chance, you have to try it at least once, but no more because it is horrible. After all that...ENJOY!! Round 1: You can clearly see I am a bit nervous to try the durian pastrie on my plate... however, the pumpkin shaped rice cake was delicious. Round 3: REAL sushi rolls, coconut shrimp, coctails, and baked oysters... oh yeah. Round 4: DESSERT!! So nice you have to say it twice...DESSERT!!! Tiramisu, chocolate fondue, raspberry bread pudding and my absolute favorite: creme brulee. Dessert in Korea isn't very common so let's just say I didn't skimp. Round 5: DESSERT...again! Chocolate cake, black forest cake, green tea cake, cheesecake...cake. Needless to say, if you ever go to Beijing, go to the Golden Jaguar Buffet... you may seem some wierd food there, and you may be the only Westerner, but you will thank us in the end! We are spending 2 years teaching English in Korea and this is all about our journey!